Just finished watching Parmanu. I LOVE YOU, John Abraham! What an amazing movie!!!! It is easy to call an Army officer a patriot. But to create movies like Madras Café and Parmanu is an act of patriotism too. This movie made me realise that Atal Bihari Vajpayee was the PM who made the Buddha smile.. it was IMPORTANT. These movies tell us what recorded history could not. Like Amar Chitra Katha, they teach us through entertainment. There, I said it. I LOVE YOU, JOHN ABRAHAM! The greatest technical strength of the movie is its editing, followed by the background music. The art direction and the sets.. it is so easy to overlook or take for granted the technical aspects of a film, but here, they just stand out. Obviously, the director has done an excellent job. And the performers - every single one of them. Boman Irani ruled the screen from the first shot, but that was hardly a surprise. A friend mentioned that the female roles were great too. I don't know about that. I do know that nowhere did i see skin, no item song and in the entire movie, I tried to find a single shot that objectifies women, and, surprise surprise, it wasn't there! Can you even IMAGINE a Hindi movie that does not objectify the female body in some way? When I told my son that the nuclear scientists paid with their lives and the mainstream media is not even talking abt the mysterious deaths of our nuclear scientists, that was another discussion point at home. Here is that media story. So, you have started seeing someone else? What do you mean, 'else'? Square ones. I like them square. I always like open kitchens. सल्फास की गोली है, और चूस के खाना है. Ab joke suno. I was trying to share this joke with others and no one knew what Sulfaas ki goli is! Reason #67319 that we should stay in touch with our agriculture sector! नदी ने पूछा कुंवे से , तेरी औकात ही क्या है? I've learnt one thing from Islam. That it is not the violence of a few that kills a religion. It is the silence of the majority. And I don't want to let that happen to Sikhism. I do not want to be the majority that stayed silent because 'it wasn't such a big issue.' It is. 1. Guru Nanak said "Ek Onkar" - There is only one God. There is no difference among his people so long as they are all devotees who do good deeds (Kirat Karo) and Recite his name(Naam Japo), preferably as a group united in devotion (Sangat). From the first Guru to the Tenth, the MOST IMPORTANT tenet of the religion has been to get over our caste identity, our superstition and belief in ritual over devotion. So, if you are a person who uses his caste name in spite of the surname given by Guruji - Singh and Kaur, then you have failed a very basic teaching of the Gurus. You can either be Singh or Bedi. You can't be both. 2. You belong to a religion which does not even allow different names for boys and girls. Which allowed a woman to reach the highest administrative role in the religion - heading SGPC. A religion that simply requires a member of the family to read from the prayer book. That member of the family can be male or female and usually, it is both. 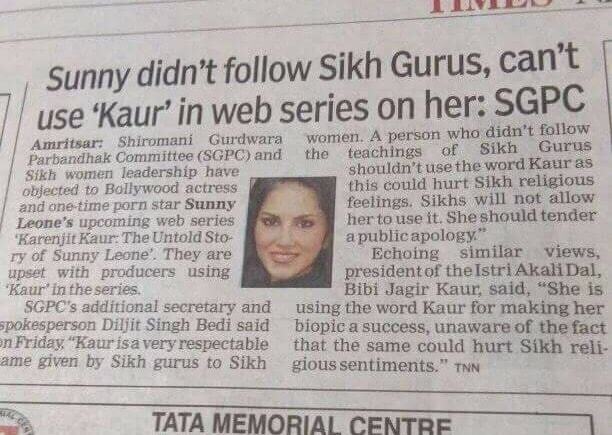 So when you try to honour kill your daughter, what exactly gives you the right to certify other Sikhs after that? 3. Guru Gobind Singh told us before he left his mortal coil - henceforth, the Hukumnama can only come from the Guru Granth Sahib. Not from any human. There will be no more "Gurus". The Granth Sahib is all the spiritual guidance that you need. So if you try to issue religious edicts, you are directly violating the most fundamental, sacred tenet of the religion - Sab Sikhan ko hukam hai, Guru Maanyo Granth. Don't you EVER dare issue an order on behalf of the religion. 4. The SGPC is an administrative body - it stands for Shiromani Gurudwara Prabandhak Committee. - The chief body for administration of the Gurudwaras. It is neither the religious head nor the spiritual guide of the Sikhs. The Sikhs do not have a religious head. Unlike the church, we don't have a hierarchical structure of spirituality that rolls up to the Golden Temple. We were told to recite our Bani wherever we were. We were told to keep our heart pure. When you try to take on a spiritual or religious policing role, the rest of us need to stand up and remind you that the Granth Sahib is our Guru and the Bani is our spiritual guide. The Sangat is where we gain our spiritual salvation. The feature of the Sangat is that every human being is equal. Which is why you see people doing Jodon ki seva (cleaning the footwear) at a Gurudwara. We grow up learning that all human beings are equal and deserve the same respect. No one can tell a person if they are a Sikh or not. There is no indoctrination ritual. No Kalma to read and no baptism to be performed. No one can decide the "degree" of Sikh that one is(another post on that). And if you are so free, work to ensure that first, you read the real teachings of the Gurus and then, you take them to a state that is getting buried under a pile of drugs. And please make a public apology to Karenjit Kaur on your way. Growing up in Hyderabad, I used to open the newspaper to the crime page and read daily reports of women who had either died, or had committed suicide as a result of "stomach ache." In some cases, there were clear reports of burning women to death. On average, there were 2-3 such reports every day. On growing older, I wondered, if there are 3 reported deaths per day in one city, how many would there be all over the country? NCRB answered that question - roughly one dowry death every hour in India. Consistently. Since 2001, that number(deaths per hour) has not crossed 2. I have added a Trend Line to the graph so we can clearly see the DIRECTION of the crime. In 2014, the worst year yet, a woman lost her life to dowry every 52 minutes. This is not going to be a post about the causes of dowry. We all know the causes of dowry deaths. What can we do to stop dowry deaths? Here is what you need to consider - of the literally THOUSANDS of cases that I have read over the years (all the way from 1988), not ONE has happened right after the marriage. All deaths, every single one of them, is preceded by abuse. Months and years of abuse. Abuse that the woman almost always reports to her family. There is a separate legal clause that deals with harassment for dowry. The ratio of abuse to death cases ranges from 13:1 to 10:1. For every woman who is killed, at least 9 to 12 other women suffer dowry related abuse - so much that they make a formal complaint. The parents, in every single case, turn a blind eye to the plight of the woman. The dowry death happens in the marital home. If you know your daughter is being abused or harassed for dowry, what is she doing in her marital home? If a parent endangers the life of their daughter by forcing her to stay in a physical space where it is known that she is in danger, should the said parents not be prosecuted? In suicide, this is abetment to suicide. In murder, this is being a complicit accomplice. I honestly feel that there should be a change in the law. Parents who ignore a daughter's plea related to dowry abuse, should be prosecuted. They should not be the petitioners. They should be the co-accused. How can you put your own child in almost certain danger, and then cry hoarse when that danger comes true? Counter - For every woman who dies, 9 to 12 do not. They continue to live in their marital homes. So if the daughter raises an alarm, should she be removed from that danger? If you were a husband or in law abusing a girl for dowry, would you stop, if you knew that the girl will be removed from the marital home AND there will be a police complaint against you? Yes, I think that a lot of men will stop then. Because dowry harassment is bullying. And in its most fundamental form, bullying is an act of cowardice that cannot stand up to courage. In the face of courage, it wilts and succumbs. Yes, the problem and the solution are not that simple. But I simply cannot find a way to forgive parents who allow their daughters to remain in danger in their marital homes and then cry hoarse when the girl dies. I don't usually agree with Gandhi, but this one: "The criminal commits the crime, the society prepares it." , can be completely translated to "The in laws commit the crime, the parents prepare it." I don't know whether its ironic or apt, that my staple medicine is called Tears Naturale Forte. - Heard from somewhere. Loved it. The previous post, On Living, was inspired by the style of a real poet - Arvind Joshi. (I have posted one of his poems on this blog earlier). And he very kindly agreed to review and improve that poem. Here is the same piece, after coming out of the "playhouse" of his imagination. Same thing, supposedly, but how different and nice it reads now! “It is hard,” he had said, finally. Living on a raft is hard. you spread out the tarpaulin. if the raft will hold. the barest things don’t break easy. you don’t want to be closed in then. not even on a raft. who got out of a deep cave? They wanted to be rescued. मगर शाम ही तो है…. Because sometimes we need to remember the obvious.. Many years ago, my father was in the ICU. With a brain stroke. For 8 days. In those 8 days, a profound change happened. I realised that no amount of money sits outside an ICU. People do. Families do. That people are not forever. That fights are useless things. When I came back, my currency had changed. It was time. The concept of wealth had changed. It was relationships. Real conversations. Nothing virtual. Physical coffee. It has been 5 years. And every day, even more strongly, I realise the importance of the lesson of those 8 days. And the inherent sense of peace. Anything for that. is such a difficult question to answer sometimes. You just nod, or make some sort of "hmm" sound indicating "ok", and move on to other things. The grass looks so tiny to us, and so giant to the ant. It is the same with the question - How are you? Innocuous to most of us, and to the rest, an incredibly tough question to answer. PS: Yes, there is a trigger to this particular episode. And yes, I will come out on the other side. He who has a why to live can always find a how. Because sometimes, Quora tells u what u need to know. There are a lot of communities - in India and around the world, that believe in voting en masse - as a group, because they are a "vote bank" and they truly believe that this will give them bargaining power with the politicians. It is the need of the politician to ensure that a vote bank remains a vote bank. Which makes it important that there is little development in this category. The minute development or even relative prosperity happens, you stop being a vote bank. It is important to keep a vote bank a vote bank. Poverty necessitates that and false promises effect that. If any people in the vote bank get rich, they will stop voting as a group. So the first condition for a politician to retain a vote bank, is to ensure that they remain poor and in need, so that they vote as a group, not as individuals with individual needs. If you vote as a vote bank, you are, in effect, signing your own poverty warrant. The Parsis are not a vote bank. The Sikhs are not a vote bank. The Jains are not a vote bank. Think about that. Now, think about the state of people who have voted as a vote bank. In 70 years, not ONE of these groups has been able to step out of their existing domain. Unfortunately, this is true of EVERY vote bank, all over the world. If you are a vote bank, it is time to step out of that and become a voter.